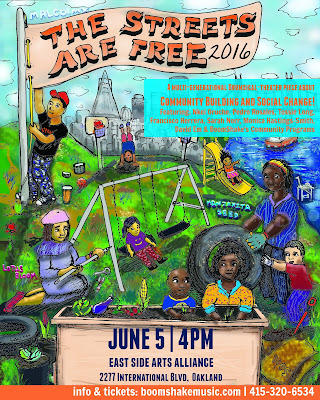 'Streets Are Free' Drumsical: Sunday June 5 4pm at Eastside! We are raising funds to cover costs of our production. To donate and support please click here to learn more and give what you can! 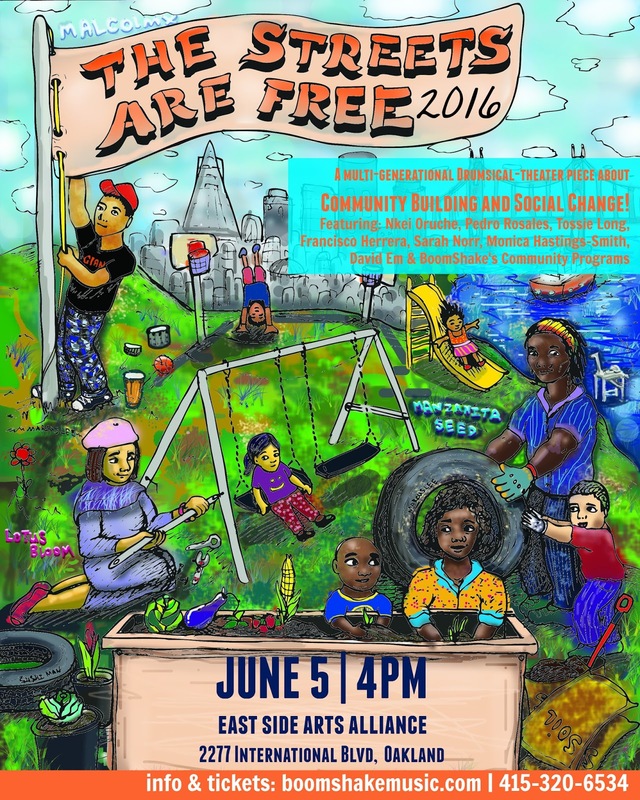 A participatory theater performance that engages community members in a musical commentary about the current conditions facing low-income communities of color in Oakland and its connection to the movement for Black Lives. The 'Streets Are Free' Drumsical is inspired by a Venezuelan children’s book by Kurusa that recounts a true story of children living in a barrio fighting for a safe place to play outside. BoomShake Community Programs, Nkei Oruche, Sarah Norr, Tossie Long (Vocalist), Pedro Rosales (Afro-Peruvian Percussionist), Francisco Herrera (Social Justice Singer-Songwriter), Monica Hastings-Smith (Singer-Songwriter), David Em (Guitarist), Josue 'D'boa' Santos (Afro-Brazilian Drummer) and a band of other instrumentalists, and storytellers. The musical travels all over the world featuring a mix of songs and rhythms contributed and inspired by the cultural heritages of our participants and guest artists. From folkloric children's music, to adaptations of contempory American music to original music by our artists, it runs the gamut: Korean, Igbo, Afro-Peruvian, Klezmer, Hip hop, Funk and more.